You and your family will be considered for partnership if your total gross monthly income (before taxes) is between the minimum and maximum limits listed above. These amounts are based on the area's media family incomes as established by HUD (Department of Housing and Urban Development). Since you will be purchasing your home from Habitat, you must demonstrate your ability to pay the monthly mortgage payment. This payment will include not only the mortgage payment, but also the payment of real estate taxes and homeowner insurance. This requires satisfactory credit, a good payment history on monthly debts, and no bankruptcies within the past three years. Meeting these family income levels is a minimum requirement. Other factors will affect a family's ability to afford a Habitat house. For example, the number of bedrooms required, the size of the house, and whether or not a garage is built will all affect the mortgage cost. A volunteer will assist applicants in understanding how this will affect individual families. 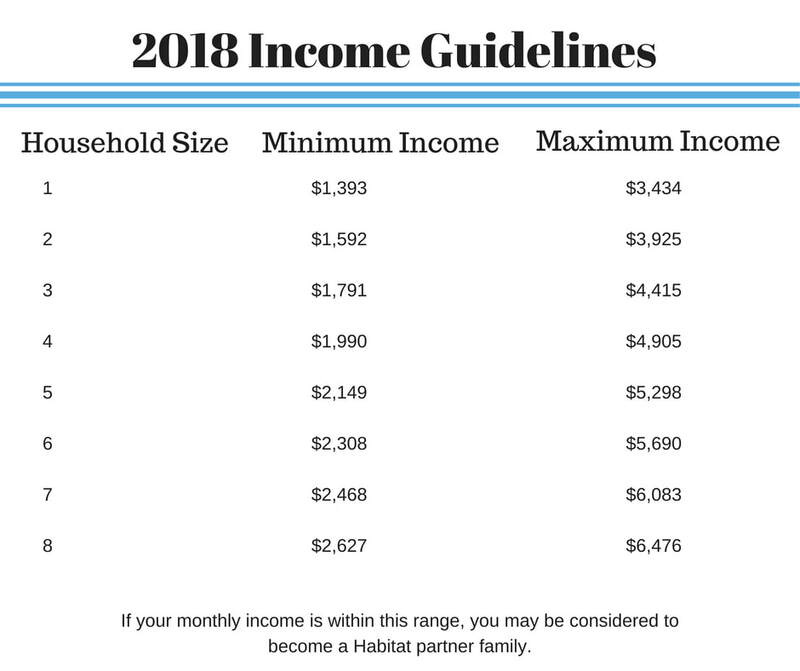 Families selected as Habitat partners will be expected to attend homeowner education classes and budgeting classes and will meet monthly with their Family Support Advocate to review their budget. Buying a home in partnership with Habitat for Humanity is a unique opportunity. We build homes with hardworking, low-income families and the community and then sell the homes at no profit with affordable mortgages to Habitat families, whom we have prepared to be successful homeowners. To download an application, click on this link. We are happy to help or answer any questions--just give us a call!